Photograph of the statue of Mary in a rock formation alongside a path through the woods near Woodstock College, Maryland, c. 1930, by John Brosnan, S.J. Courtesy Georgetown University / Woodstock Theological Library Collections. Fitzgerald’s religious upbringing did influence his fiction—often subtly, sometimes overtly, and most famously in his debut novel, This Side of Paradise (which features a monsignor modeled after Fay and was dedicated to him). 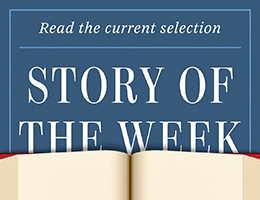 Written about the same time, the short story “Benediction” was inspired by that first visit to a seminary years earlier, and we present it in full as our Story of the Week selection.